Despite its faults, the Homepod has the potential to be an even better smart speaker if Apple would just let everyone who decided to spend the $349 use it equally. The Homepod has a simple silhouette that allows it to blend into any setting. One of the more exciting new categories in audio comes in the form of smart speakers. After the surprise hit that was the Amazon Echo, it seemed that every company was trying to put a speaker in your home. But they didn’t always sound good. The original Google Home was like the Echo in that it wasn’t exactly built for listening to music, it was made to be the central hub of your smart home (assuming you installed smart door locks, thermostats, and light bulbs). But now we’re seeing the transition from helpful kitchen assistant to the center of your home entertainment system. 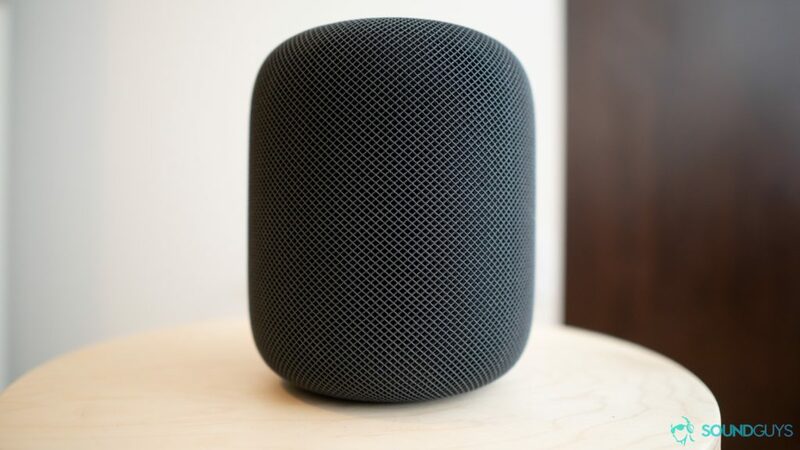 We already looked at the Google Home Max, but there is also the Apple Homepod to consider. Unlike the Home Max, the Apple Homepod is pretty small and has a few significant limitations. But does that even matter? Let’s find out in our Apple HomePod review. Someone who owns Apple hardware (iPhone, iPad, Mac). Actually, this part is mandatory. It’s usually easier to get the most out of an Apple product if you already have another Apple product. Just look at Airdrop for an example. But in the case of the Apple Homepod, having another Apple device is basically mandatory. Without a Mac, iPhone, or iPad, the Homepod can’t be used. Apple Music subscribers. If you’re an Apple Music subscriber, this speaker is perfect for you. You can ask Siri to play everything from that new Miley Cyrus song to jock jams, and it’ll oblige seamlessly. If you’re not an Apple Music subscriber, then keep reading because getting this speaker to do what you want might be an issue. Anyone that doesn’t want Google tracking them, but don’t mind Apple doing it. If you’re not too happy about the fact that Google has a record of everything you ask the Google Home, then the added privacy of the Apple Homepod might just be the deciding factor for you. Of course, it’s only a little better. They’re still recording you, but your inquiries are assigned a random ID instead of being associated with your account. Also, the legal implications of having something in your home that’s always listening are still being debated. We spoke about this topic extensively in our podcast episode titled, “Smart Speakers, A New Legal Frontier” so make sure to give that a listen if you’re interested in learning more about the subject. How do you connect to the Apple Homepod? Up top is a touch-sensitive pad for controls that also lights up when you say the hotword. The Apple Homepod is a smart speaker, which means you have to connect it to your WiFi if you want it to work. Once you plug it in you’ll need a device running iOS 8 or higher in order to set it up. Go into the Home app and simply follow the instructions to get it up and running. If you’re doing this on an iPhone or iPad, the process is seamless and you’ll be done within minutes. But if you’re an Android user or don’t have any device running iOS 8 or newer: then you’re up a creek without a paddle. Unlike Google’s Home Max which doesn’t really care what phone you have, the Apple Homepod requires another Apple device to get it up and running. Once you sign into Apple Music, you’re good to go—just ask it to play a song and it’ll oblige. Which brings us to the second major downside of the Apple Homepod. It only pulls music from Apple Music service. If you use any other music streaming service you’re out of luck. Additionally, there’s no 3.5mm input on the device, so you can’t sidestep this by connecting an audio cable. One way around this is to Airplay audio to the speaker, but again: that’s only if you have an iOS device, as Airplay isn’t available on Android devices. One cool feature of Airplay 2 is the ability to sync up two Homepods and turn them into left and right channels. Unfortunately, we only had one Homepod available so we weren’t able to test this feature out for ourselves. For playback controls you’ll get the plus or minus signs for volume, and the space between can be tapped for pausing. One good thing about the Apple Homepod is the microphones do a great job at picking up your voice, which is important as that’s the main way to control playback if you’re not within arms reach. Whether volume was on ten percent or on 100 percent, it usually picked up my voice on the first or second try of saying the hotword. This is great when you compare it to something like the Google Home Max which had trouble picking up my voice when music was playing loudly even if I was standing close to it. If you don’t feel like using your voice, there is a touch-sensitive pad on top of the speaker which lets you pause or play music by tapping the middle, adjust volume by pressing the minus or plus signs, and even access Siri by long-pressing the middle of the pad. The only cable you have to worry about with the Homepod is the power supply cable on the back. For the most part, the build quality of this speaker is great. It’s covered entirely by a plush fabric that hides most, if not all, of the plastic that the speaker is surely made out of. I have basically nothing negative to say about the way this speaker is put together. And although I do find the minimal design to be absolutely gorgeous when it’s sitting on my counter-top or bedside table, I did find the placement of the touch-sensitive screen on top of the speaker to be more inconvenient than it was helpful. As Gary would say, let me explain. The fabric surrounding the speaker is padded and easy to move from one place to another, assuming you don’t mind unplugging it to do it. Every time you say “Hey Siri,” the Siri graphic appears on the touch-sensitive display letting you know that it heard you and is now listening for your next command. It’s useful when you’re standing next to it, but if you’re across the room it’s almost impossible to tell if the speaker heard you. More than once I ended up repeating the hotword at the same time that Siri was answering my question just because I didn’t realize it heard me. In contrast, the Google Home Max has four lights embedded in the fabric on the front of the speaker that light up to let you know it’s listening. The Amazon Echo does something similar with its ring of light. The Apple Homepod basically asks you to trust that it’s working (which is a good metaphor for Apple products in general actually). To be fair, more often than not the microphone picks up my voice perfectly fine—but a slight visual cue would be nice. This is where things get interesting. Like the Google Home Max, the Homepod also has microphones inside that self-adjust the EQ depending on how close it is to a wall or other objects so that the sound stays relatively constant throughout using it. If you place a speaker near a corner, the low end gets a nice boost from bouncing around. The microphones can hear that this is the case, and then tone down the bass notes to maintain a reliable sound. As was the case with the Google Home Max, I can’t really prove that it’s doing this. But I can say that whether the speaker was in a corner on my counter or in the middle of a room, I couldn’t hear any meaningful differences between the two. The Apple Homepod isn’t a large speaker, so its low end isn’t going to be overwhelming like it is with the Google Home Max. It also doesn’t get as loud as the Google Home Max, but both of these traits work to its advantage. There’s still a strong enough bass where it’s easy enough to follow the bassline all throughout the song Let It Happen by Tame Impala, but it isn’t strong enough that it gets in the way of any of the vocals or other instruments in the lower mids. Bass kicks easily pulse along underneath the synths and keeps the rhythm easily felt, but it definitely isn’t as powerful as something like the Google Home Max. Not to make it seem like the Home Max is a bass-hungry monster, but the Homepod definitely seems like it’s holding back at times in order to put equal emphasis on other elements besides just bass. Vocals in the song Send Me a Peach by The Blasting Company has plenty of clarity and the backing bass vocals never mask what’s going on. When it comes to highs, the Homepod also shows a good amount of control. Highs definitely seem underemphasized a bit in order to avoid harshness, but there’s also a slight push in a few narrow bands so that cymbals can still be made out even if they’re lacking in prominence. A good example of this are all of the cymbals crashes in the song Step Out by Jose Gonzalez which can be plainly heard all throughout the chorus, even if they sound almost muffled when compared to, say a good pair of open-back headphones. The touchpad is made of a glossy plastic that might not a good wiping down every now and then. When it comes down to it, I have no problem saying that the Apple Homepod is the best sounding smart speaker I’ve heard. And yes, that includes the Google Home Max. The Homepod doesn’t have the same bass-heavy response that manufacturers tend to be leaning towards, but I personally like that. By keeping things tastefully focused on sound quality and not mass-appeal tuning, music is much clearer-sounding. The Home Max has a more “consumer friendly” sound with a bigger bass response that I think more people will enjoy, plus the Google Assistant is light years ahead of Siri. When it comes down to it, the Homepod has far too many limitations to recommend to most people. It’s actually impossible to recommend to anyone who doesn’t have at least one device in the Apple ecosystem, and unless you’re a subscriber to Apple Music it will never work as seamlessly as you’d want it to. If you’re already neck-deep in the Apple ecosystem, you might like this speaker. But it’s still worth looking into the Google Home Max or even something like the Sonos One before you make your final choice. The Sonos One still provides good sound, has a trustworthy ecosystem backing it up and promises support for all the major voice assistants. It isn’t exactly a smart speaker, but it’s close enough. But heck, if you’re already in the Apple ecosystem: none of this matters anyway. You’re just going to buy the Homepod anyway, right?